Is there any reason that the smart effector could not be used on a corexy style printer or is there a better solution to mesh bed levelling for this style of printer? I see no reason why it couldn't be used on a CoreXY printer, although the triangular shape might be awkward to mount. Depending on your hotend type and mount, I would consider a piezo sensor. They share very similar performance characteristics to the smart effector but can be more compact. See my signature. If the OP is starting from scratch with a build, it's really not too difficult or costly to use aluminium tooling plate, with or without glass to make a flat build plate that negates the need for any flatness compensation. For sure I'd agree. Use of glass or tooling plate and adjustment screws negates the need for any probe. The manual probing wizard is pretty good, and for 3 point levelling is not too onerous at all. If you want a 200 point grid then it's going to get tedious. The build plate is a 10106028 sheet of glass mounted to the frame so I am expecting that there will be at least some small inconsistencies to be compensated for. As the whole machine is designed from scratch incorporating components is not enormously problematic. It seems to me that the smart effector is a very neat and compact solution that would not require the space or alignment of an additional probe. Fair enough but you'll need a heat spreader under the glass so why not make the heat spreader from 8mm thick tooling plate then use say 6mm glass which can also be removable? Whatever you decide to do, don't be tempted to use toughened glass. I know from experience that the toughening process causes distortion. Float glass is perfectly fine. A Piezo20 module takes up way less space than a smart effector (if your talking about fitting it into a corexy) and uses the nozzle in the same way. I've had a look at the Precision Piezo and it appears, to me at least, functionally identical to the Smart Effector. Well smarteffector was inspired by Precision Piezo so it should be. They function on different sensing modality but very similar accuracy, repeatability and both are nozzle probes. Actually, no it wasn't. I had been kicking around the idea of a PCB effector with built-in strain gauge for two years already. But by the time we came to making it happen, you had introduced piezo based nozzle contact sensing, and because of that we made both strain gauge and piezo prototypes (we nearly made an accelerometer base version too). We chose the strain gauge design because it worked sufficiently well and was easy to manufacture; whereas the piezo design required drilling piezos and printing plastic mounting parts. I don't like the sound of that. I discussed my requirements with my local glass supplier who insisted that I should have toughened for safety and that it if it wasn't flat enough I could return it, as toughening can induce rippling. As I said to them it needed to be flat to the thickness of a sheet of paper so finger crossed it is. Okay I'll rephrase, smart effector came after piezo nozzle probe and works in a very similar way but using a different sensor. I am working on doing just this and have a mount already but it uses a pair of 12mm Diameter rods to slide on if your interested. Yeah that's the sort of thing I was thinking. 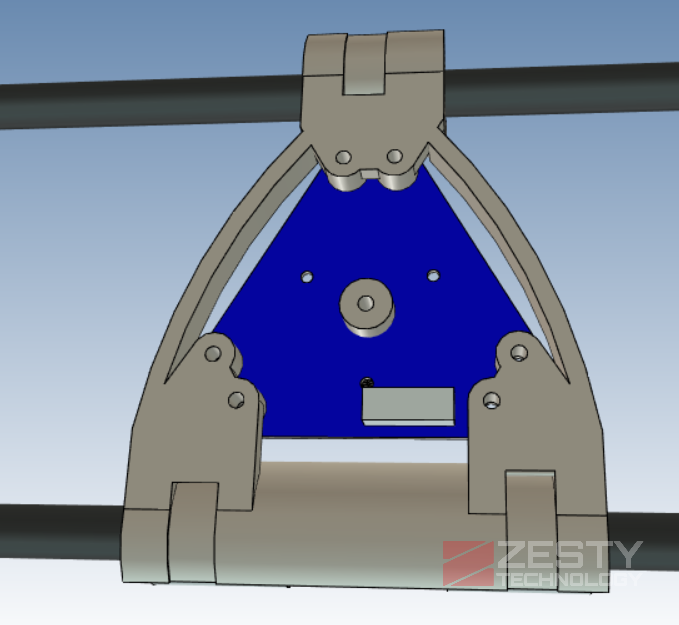 I am also using 12mm rails I designed a carriage for the titan aero (not sure how to add a photo) which has an x and z offset between the rails but side by side rails seem ideal for the smart effector and a zesty nimble as I now intend to use. Lykle @Zesty designed the carriage for my and it uses IGUS Bushes mint will have a Nimble Sidewinder on it. I'm using IGUS bushings too on rolled carbon rails but with a standard nimble, as I was unsure if the long drive cable used with a sidewinder would sag into the build volume. Therefore I will likely mount the extruder motor at the top of the frame. What stage is your build at? I am working on doing just this and have a mount already but it uses a pair of 12mm Diameter rods to slide on https://cdn.discordapp.com/attachments/280318450893586433/398447577378455554/image.png if your interested. WoW! 12 mm rods, I use 8 mm rods with no problem. I use good quality rods from McMaster Carr and solid linear bearings that are coated for less friction. Smoother then the cheap ball bearing type. I have been considering using the Smart Effector on my Corexy and mounting it with the Mag Ball setup, just cut off the shafts and use the cup bearing and magnet. Easy on/off. I am using the Mini differential IR height sensor on my corexy with no problems and the Smart Effector on my Delta, both work great.